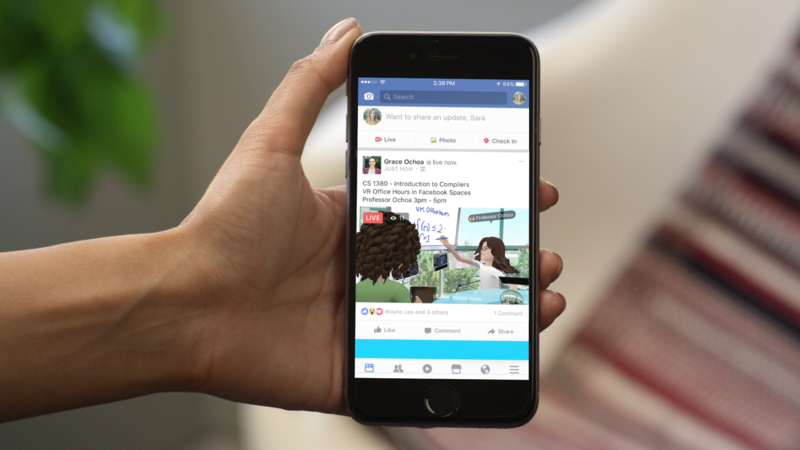 Now you can show the world what Facebook Spaces is like. Earlier this year, Facebook launched Spaces, a social VR experience that lets you and your friends interact with each other in virtual reality. Now, the company is ready to introduce a new aspect of Spaces by merging it with another Facebook product: Facebook Live. That's right; starting today, anyone with an Oculus Rift can livestream directly from Facebook Spaces, letting anyone and everyone have a peek inside your VR universe. To do this, you'll access a new virtual tool in Spaces that looks like a tablet. Pick it up, hit the "go live" button, and it'll livestream your VR world to your Facebook feed where you friends and family can view it. You can then show off various Spaces experiences like traveling through vacation photos, watching a video together or interacting with fellow VR buddies. The tablet, according to Spaces' head of product management Mike Booth, essentially acts as a "magic mirror" of sorts that gives you a view of what everyone will see when they look at the livestream. Think of it as a virtual camera viewfinder. As you're livestreaming, your audience can add reactions like the Like thumbs up or a heart symbol just like regular Facebook Live, except that in Spaces, those reactions come flying out of the aforementioned "magic mirror" in the VR world. Also, as your audience leaves comments, you'll see them appear as stacks next to the magic mirror. If you want to address one comment in particular, you can "grab" the comment from the stack and make it into a virtual sign. This, Booth says, lets people in the VR world talk back to the audience and respond in a personal way. The inspiration behind the addition of Live was Messenger Video Calling, a feature in Spaces that lets you call people in the real world and have them see you and your virtual avatar in your virtual world. That, however, was a one-to-one experience. "With Go Live, we can have the same experience with many people at the same time," says Booth. "Our big goal behind this is that, VR is for everyone," continues Booth. "A lot of people don't know what VR is; they think it's something that gamers do." But if they can see and interact with this livestream of a social VR experience, they might think otherwise. "It's the ultimate communications device," says Booth. "People are the killer app for VR." The livestream feature will roll out to Spaces starting today and throughout the rest of the week. Facebook Spaces is only available on the Rift at the moment, though there are plans to release it on more platforms in the future. Which is great, unless you're not sold on the whole thing in the first place.